Hi everyone. 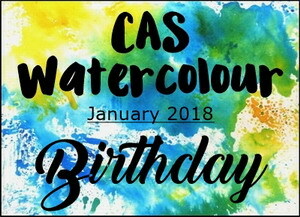 A reminder that we are already half way through the CAS Watercolour January Challenge - Birthday. There's still just over a week left to play before it closes. 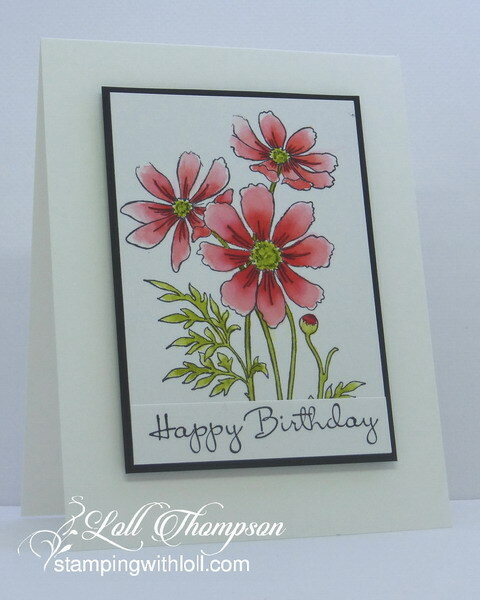 I used distress inks to watercolour all four of the cards I'm sharing with you today. Wink of Stella was added to the center of the flowers for a little sparkle, but doesn't show in photos. Here's close-ups of all four ... the first (same as above) is my favourite colour combination (abandoned coral topped with barn door). Then I wanted to try purples (dusty concord topped with wilted violet). Next up is the flowers in pinks (festive berries topped with picked raspberry). And last, but not least, yellow and orange (squeezed lemonade, abandoned coral). Please check out the challenge reminder post HERE to see more inspiration from our wonderful Design Team and Guest Designer, Birgit. 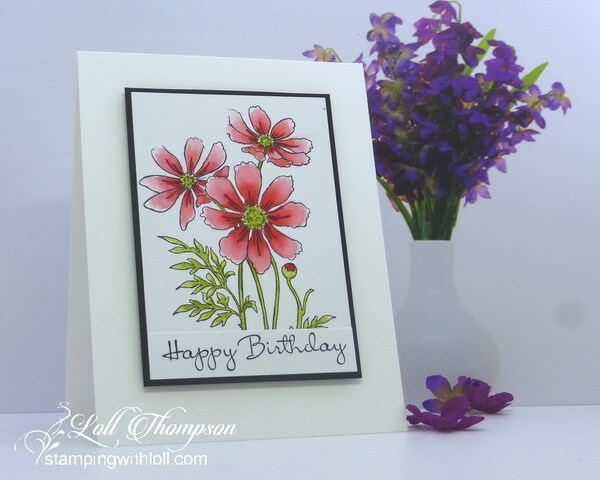 such a wonderful set of birthday cards - my mother's favorite flower was the cosmos and i love them done in all the different colors. Your painting just gets better and better, Loll! Love the beautiful colors on these and the perfect shading and blending. What a lovely reminder that spring may be just around the corner- or at least we can hope for that! What a wonderful set of birthday cards - four fabulous colour combinations!! My favourites are the first and third - love the two variations on pink! It must have been fun deciding on all the colours! 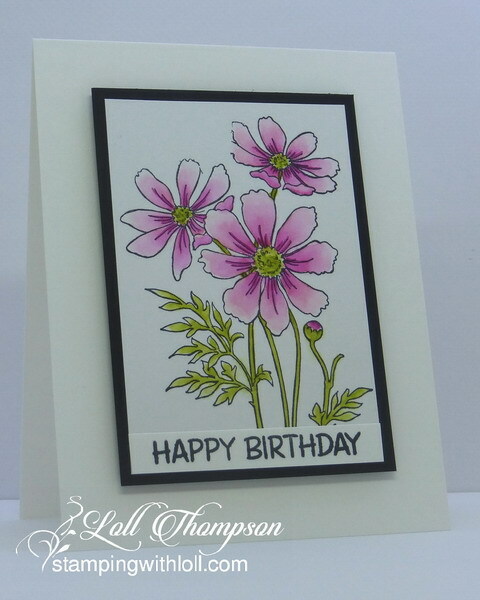 Beautiful design and beautifully executed - that's a lovely floral stamp. Wow, it's impossible to pick a favorite, my friend! I love each color combination and how the black frames the flowers beautifully! 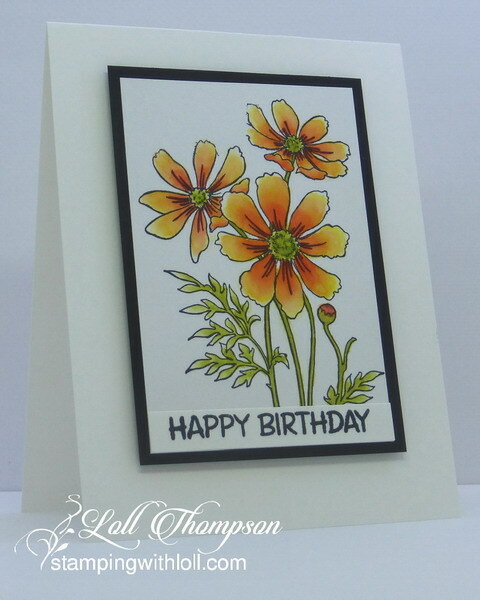 Gorgeous color combinations for all 4 of your beautiful floral birthday cards Loll. 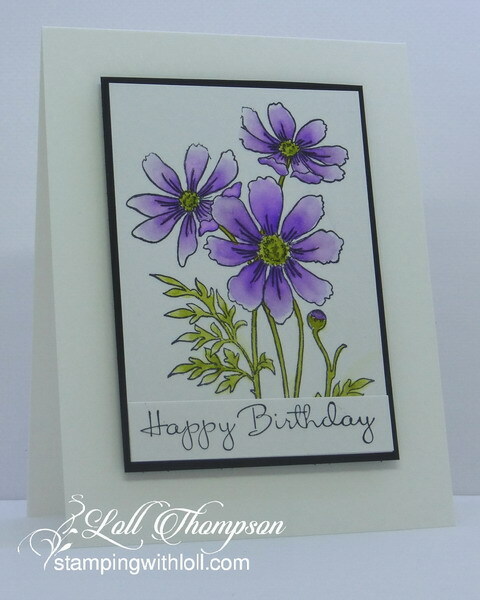 How fun to send a friend a Birthday card with their favorite colors:-) I love your shading and choice of flower stamp. TFS my friend. I am like Bonnie, I could not possibly pick a favorite card:-) Hugs. These are beautiful. Love all the different colour versions. The black frame is a great contrast. Wow, Loll! This set of cards is just so lovely! I really like seeing the image in different colors. You are so talented and creative. I so appreciate your sharing all that you share! Have a happy day! One thing I love about Cosmos is all the beautiful colors they come in and you've replicated them so well with your gorgeous watercoloring, Loll. Beautiful shading on your flowers.